Traditional Chinese medicine (TCM) originated in ancient China and has evolved over thousands of years. 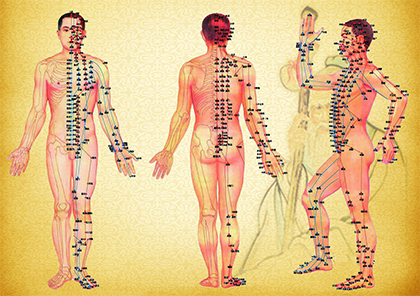 TCM practitioners use herbs, acupuncture, and other methods to treat a wide range of conditions. In the United States, TCM is considered part of complementary and alternative medicine (CAM). TCM emphasizes individualized treatment. Practitioners traditionally used four methods to evaluate a patient's condition: observing (especially the tongue), hearing/smelling, asking/interviewing, and touching/palpating (especially the pulse). TCM practitioners use a variety of therapies in an effort to promote health and treat disease. The most commonly used are Chinese herbal medicine and acupuncture. Chinese herbal medicine. The Chinese materia medica (a pharmacological reference book used by TCM practitioners) contains hundreds of medicinal substances—primarily plants, but also some minerals and animal products—classified by their perceived action in the body. Different parts of plants such as the leaves, roots, stems, flowers, and seeds are used. Usually, herbs are combined in formulas and given as teas, capsules, tinctures, or powders. Acupuncture. By stimulating specific points on the body, most often by inserting thin metal needles through the skin, practitioners seek to remove blockages in the flow of QI. Other TCM therapies include moxibustion (burning moxa—a cone or stick of dried herb plant or part of a plant used for its flavor, scent, or potential therapeutic properties. Includes flowers, leaves, bark, fruit, seeds, stems, and roots, usually mugwort—on or near the skin, sometimes in conjunction with acupuncture); cupping (applying a heated cup to the skin to create a slight suction); chinese massage; mind-body therapies such as Qi Gong, Tai Chi; and dietary therapy. What condition you can treat? Yes . The needles are sterile, for one use and come in a sterilized package. After every use, they are immediately discarded. Most time, patients feel no pain. However, with chronic illnesses and first-time patients, there may be a tingling or heat sensation as muscles relax and circulation and nerve function are restored . Acupuncture involves the insertion of fine needles into specific points on the body, followed by gentle manual or electrical stimulation of the needles. Blood flow in the tissues increases when small vessels around the area of the needle dilate. Treatment vary according to the conditions. Six to ten treatments is the minimum for most conditions.